Known for her wide array of works that bring light to social inequality, Carrie Mae Weems (born April 20th, 1953) is described by New York Times’ Holland Cotter as “one of (the) most effect visual and verbal rhetoricians.” A good portion of Weems’ work focuses on revealing the untold stories of African Americans and challenging societal assumptions placed upon groups of people. At the age of twenty, Carrie was gifted a camera on her birthday and delved into taking photographs. This led to her studying photography and design at San Francisco City College in 1974 and then receiving her BFA from the California Institute of the Arts in 1981. At this time she completed her first body of work, Family Pictures and Stories, which features images she captured of her own extended family. This series is said to be a response of a sorts to senator Daniel Patrick Moynihan and his presumptions that the African American community experiences the troubles they do because of the matriarchal nature of their families. Weems went on to document her family in a way that showcased their everyday troubles in the most realistic fashion in order to show an unseen part of her community. Continuing her education even further, she then received her MFA from the University of California, San Diego in 1984 and later on studied in the folklore graduate program at the University of California, Berkeley. 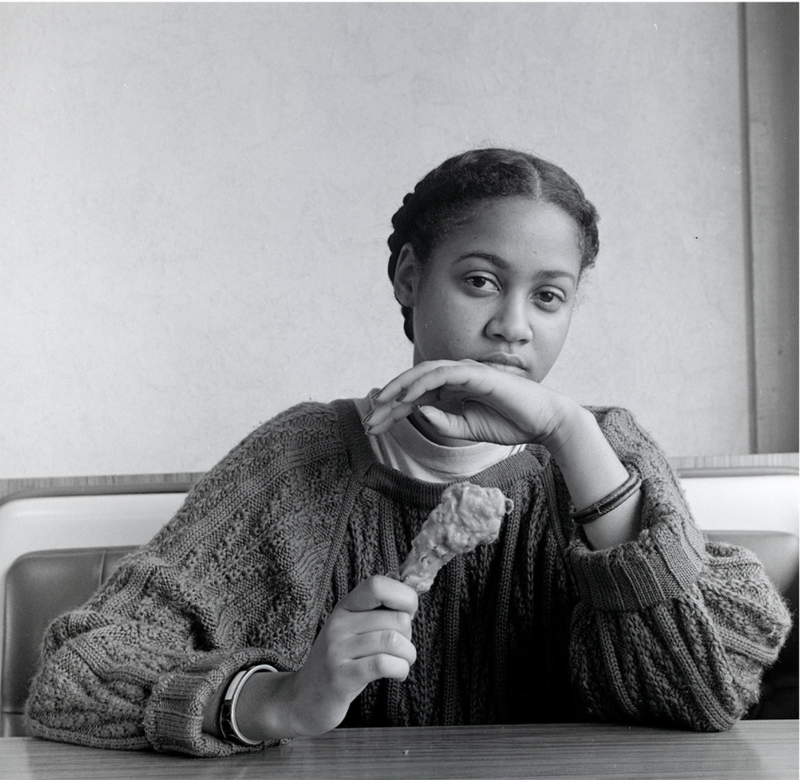 In the Kitchen Table Series (1990), she starts to use herself as the main subject of her work. Though it is a portrait of herself with other elements intertwined, it’s clear that the image is about her as a representation rather than her as an individual. To quote Weems from her interview with Dawoud Bey, “... this woman can stand in for me and for you; she can stand in for the audience, she leads you into history. She’s a witness and a guide. She changes slightly, depending on location.” This series particularly creates a way to question certain ideas revolving around relationships and their problems, their roles in this society. How a table in a house will have so many different conversations, fights, moments of life that pass it by- a true and honest look into the human condition in reaction to relationships. It’s important to note that while Weems is profound in the realm of photography, she also has had many successful bodies of work within video and installation art in order to tell her stories. She started to consistently make videos in 2003 and released “A Requiem to Mark the Moment” in 2008 which featured A Woman in Winter. Segments of Weems’ films can be found on her YouTube channel. In this particular segment, she performs a calming voice over while an African American woman dressed in white is standing amongst the wind sweeping blossoms towards her, filling the room with a dreamy sense. The woman is reflecting the moment of time between the end of winter and beginning of spring as Weems says, “With one step, she can be in the future in an instant or in the past, or in the moment. The now. But to get to the now, to this moment, she needs to look back over the landscape of memory. Lost in memory, the woman faces history. A history with a story that has been told a thousand times before.” This piece fills the viewer with a contemplation of the past, while being reminded of the glimmering beats of hope that seem “just out of reach”. Carrie Mae Weems is still producing work, still challenging societal norms and using her artwork as a means to bring attention to overlooked topics. Her work has not gone unnoticed as she’s been in numerous exhibitions, received awards such as the BET Visual Arts award and was the 2014 honoree for achievement in fine art from the Lucie Awards. Her work continues to investigate family relationships, gender roles, the histories of racism, sexism, class, and various political systems. Her most recent performance pieces, “Grace Notes: Reflections for Now” comments on the current racial tensions in the United States and the importance of grace in order to pursue democracy. This work combines spoken word, projected video, dance and music to illustrate the recent deaths of young black men in America. The beautiful thing to note is that this performance uses the same set as "The Woman in Winter" from 2008, yet this time the main subject changes from cast member to cast member, whether it be a song of grace or a reenactment of a protester running from the police, fearing for his life. The Spoleto Festival USA commissioned this piece so that it would honor the recent murders of the nine churchgoers at Emanuel AME Church. Carrie speaks to her Grace Notes cast one day at a rehearsal, "The thing to me that is remarkable about our history, about who we are, about how we have conducted ourselves in the onslaught of history, is to maintain the core of our dignity…that is really the ultimate call of grace." If you would like to keep up to date with Carrie Mae Weems visit her website or like her on Facebook!